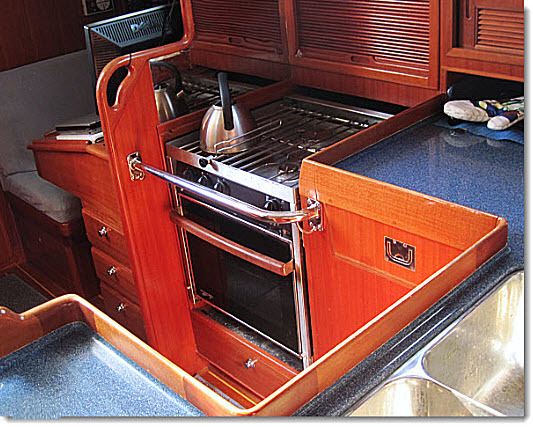 Cooking in a small boat galley can be a tough challenge in a seaway. But tasty, nutritious food will boost the energy and morale of your sailing crew or partner sky-high! Follow these five sea-tested secrets for success to save time and energy–wherever you choose to sail or cruise. 1. Begin with “First Day” Bland Foods. Crew and cooks often don’t feel so well the first couple of days. Prepare two days worth of bland food ahead of time. Stay away from heavy cream sauces or fried foods. Stuff zip-lock bags with raw veggies like sliced carrots, celery sticks, or cucumber. Pasta eaten cooked with just a bit of salt for flavor works well to tame a seasick tummy. Stay away from greasy toppings like spaghetti sauce. That will come later on in the trip. For now, try just plain pasta to keep your energy up and help keep mal-de-mar away. Need a fast “on the go” high energy snack for rough weather or watches? Mix nuts, seeds, and dried fruit for energy boosting trail mix. Make finger food out of meats; slice it into cubes. 2. Pull out Ingredients from the Get-go. Before you open the first can, pull everything you need to make, mix, and serve the meal. Include pots, pans and ladles for cooking and plates, bowls, and silverware for serving. If you need to add “zing” to your food with spices, pull the bottles out of cupboards and lockers before you start to cook. Think about where those dirty pots and pans will go when you’re done. Forget most galley sinks. Unless you’re fortunate to have super deep, double sinks, you will run out of room fast. Use large, deep buckets 1/3 full of sea water (for ballast) to hold your dirty pots, pans, and dishes. 4. Put the “Brakes” on Slippery Serving-ware. Dampen towels or rags and lay them all onto the opposite counter or a table. Otherwise, plates and bowls will skid across slippery surfaces like a raw oyster on a slide. Acclaimed author and veteran cruiser John Vigor puts a bead of rubber cement on the bottom of plates and bowls. Once dry, it grips any slick surface like a barnacle on a boat bottom. 5. Practice Safety First and Foremost. Strap yourself with a wide galley-belt, hooked on to strong pad eyes that span the boat galley. When heeling or pitching, this will keep you in place. Keep a charged fire extinguisher or fire blanket close at hand. Wear a high topped full length apron to protect you from splashing liquids. The old standard was to wear high topped foul weather pants (chest highs with suspenders) to protect you from splashes in the galley. Today’s synthetic foul weather gear could be dangerous if it caught fire. Wear the apron instead. Don’t pour from a pot or pan–use a ladle or spoon the food into bowls. Pick up a cup or mug before you pour coffee or tea from a pot. This helps synchronize the motion of the cup with the spout. Cooking in a seaway will exhaust even the most experienced sailor. Learn to prepare, cook and serve a “one potter”. This applies in particular to folks that like to sail as crew. Think of a meal that you could you make that requires just one deep pot (or even a pressure cooker) from start to finish. Soups and stews are always welcome, as are chilli or pasta dishes. These are perfect one-pot meals. Pick one and master it. My own specialty was breakfast–in particular omelets. When you contact the skipper, let him or her know your specialty in the galley so they can put the ingredients on the provisions list. Learn a one-pot recipe to become an instant hit with the hungry crew. Use these sailing tips in your small sailboat galley the next time you cast off for coastal or offshore cruising. Save time and energy and keep your hungry sailing crew satisfied–wherever in the world you choose to sail or cruise! This entry was posted on 22 October , 2014 by metbob2. It was filed under Uncategorized .